Kleinstever et al (2015) have just published in Nature the results of their efforts to systematically redesign the PAM specificity of Streptococcus pyogenes Cas9 (SpCAS9)and their results relieve a notable constraint on the S. pyogenes CRISPR/Cas9 platform. As powerful as the CRISPR/Cas9 (SpCas9) system is, it has constraints. Notably, SpCas9 requires recognition of a short sequence next to the target sequence – the protospacer adjacent motif (PAM). SpCas9 recognizes NGG PAMs and while this sequence is common, it does pose a limit to the native SpCas9 when high precision applications are needed. This constraint could be relieved by using Cas9 proteins with different PAM requirements. These might come from other species of bacteria or as Kleinstiver et al have shown by directed evolution of SpCas9. The authors describe two screens performed in E. coli in which they can specify a PAM and then screen for SpCas9 variants for those that are able to recognize the new PAM. 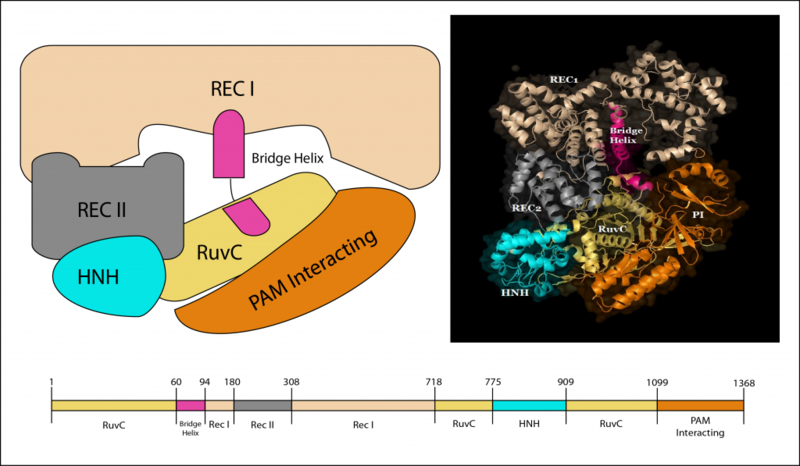 he Cas9 protein is comprised of six domains: Rec I, Rec II, Bridge Helix, RuvC, HNH, and PAM Interacting. Domains are shown in schematic, crystal, and map form. (original figure) (crystal image rendered from PDB: 4CMP Jinek et al. 2014 See https://sites.tufts.edu/crispr/crispr-mechanism/ for a nice explanation of mechanisms as we currently know them. Two variants, the triple mutant – VQR (D1135V/R1335Q/T1337R) and the quadruple mutant – VRER (D1135V/G1218R/R1335E/T1337R), were analyzed in some detail. Note that all of these changes, as expected, are in the PAM interacting domain of the protein. In human and zebrafish, the VQR variant cleaved targets with NGA PAMs while the VRER variant has the highest activity again targets with NGCG PAMs. The screens used in these protein evolution studies were also applied to the modification of Cas9 proteins from other species such as Streptococcus thermophiles and Staphylococcus aureus. The authors show that the variants they created with these proteins also functioned in human cells. To identify target sites for the VQR and VRER variants the authors developed a web tool – CasBLASTR that could be useful to potential users of these Cas variants (http://www.CasBLASTR.org). The VQR and VRER variants could be introduced into versions of the protein one already has in the lab by site directed mutagenesis. The results reported here and those of others now give us an larger set of options when considering target choice and very quickly it is becoming possible to access any site within genomes with these new technologies. This is a paper worth having a look at if you are feeling constrained by current PAM specificities or if you just want to know what is currently possible.